"Invaluable, straight-forward, fabulous, whole-heartedly recommended"
​“I am one of those many fools who paid a huge amount of money for a useless course. I now look on Mike as my mentor as I embark on a career. Thank you Mike.” Emma Steel, Proofreader and International Structural Editor. “I thoroughly enjoyed the course and am so glad that I decided to take it... the whole experience was invaluable. My... proofreading service is now well established and your course played no small part in getting it off the ground.” Hache L. Jones, Proofreader. “What can I say? Worth every penny and then some! God Bless! This is a fabulous course.” Teresa Richardson, Proofreader. Before you read her full testimonial, here's a little bit about Emma and what she has achieved in her proofreading career. Emma has proofread articles, website content, essays, blogs, itineraries, biographies, novels and resumes. She specialises in working with clients who have English as a second language, from countries as diverse as China, Sweden, Holland and Peru. "I have Alzheimer's disease and I am an advocate and prolific campaigner for increased research, funding and understanding into the disease in the USA. Without Emma's help in writing and editing I would not be able to do what I do. She always delivers work on time, and to extremely high standards. She has written my speeches which have been presented to Harvard University and many committees and meetings. Emma also co-wrote and co-edited a letter which has been submitted to the United States Congressional Record. With her continued help I have reached more people and had a huge amount of success." " ... an excellent asset." "... very dedicated, patient and punctual..."
"... professional, talented and brilliant." " Emma’s input was pivotal." Now, let's hear from Emma, herself. “I am one of those many fools who paid a huge amount of money for a useless course. Hindsight is a wonderful thing and, unfortunately, I didn’t come across Mike’s website until it was too late. We live and learn. “I now work with clients across the globe and it was Mike that gave me the tools and the confidence to go out there and do it. “You may remember one teacher at school or college – the one whose class you really looked forward to, the one who you would always do your homework for on time – well, I may have had to wait a few decades but I have found in Mike what most people experience in school: a teacher who inspires. “I now look on Mike as my mentor as I embark on a career. I took your proofreading course because I wanted to start to offer a free proofreading service to self-published writers who are unable to afford a professional service. I thoroughly enjoyed the course and am so glad that I decided to take it before I began offering the service. I loved your relaxed style and thought the whole experience was invaluable. I also took your advice and joined up with [you'll have to read the eBook to learn about this! Mike]. I get a great deal out of that work as well as making sure that I keep my brain sharp and my eye keen. So thank you. My free proofreading service is now well established and your course played no small part in getting it off the ground. I'd just like to thank you first of all for writing such a great, straight forward eBook, and then going above and beyond what I would even expect as a customer by providing us, completely free of charge, updated versions months later! What can I say? Worth every penny and then some! God Bless! This is a fabulous course. 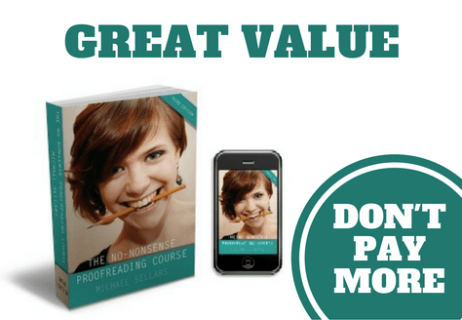 As someone who has effectively been proofreading for thirty years, I found Mike’s No-Nonsense Proofreading Course an invaluable introduction and a very useful practical guide to many aspects of this discipline. I can wholeheartedly recommend it as the ideal starting point, and much more besides.